Stock photo of view across Bottle Cove towards the town site of Little Port at the end of the Humber Arm near Lark Harbour, Newfoundland, Canada. This stock photo shows an attractive view across the blue waters of Bottle Cove towards the town site of Little Port at the end of the Humber Arm near Lark Harbour, Newfoundland, Canada. 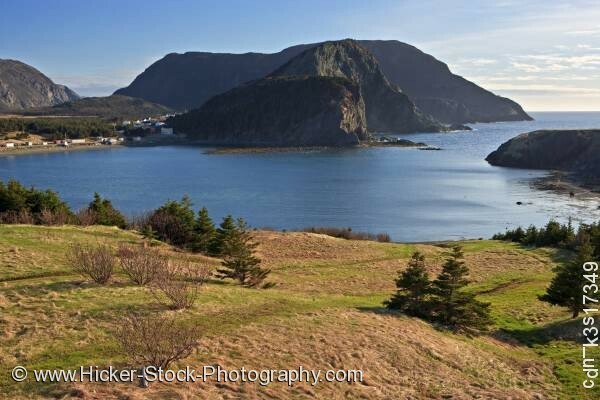 A rolling hillside shows a view of the deep blue waters of Bottle Cove. The town of Little Port sits to the left and is miniature in size next to the rocky cliffs of Humber Arm. Evergreen trees and dormant plants are scattered among the brown and green patches of the hillside leading to the watery edge. The rugged cliffs surround the area along the shoreline of the cove protecting the small town of Little Port. The blue waters seem endless in the horizon leading to a backdrop of blue skies and white clouds. View across Bottle Cove towards the town site of Little Port at the end of the Humber Arm near Lark Harbour, Newfoundland, Canada.